We have collected and analysed 10 expert reviews and 3 user reviews from international sources. Experts rate this product 68/100 and users rate it 100/100. The average review date is 27-10-2018. We have compared these reviews to 213025 reviews from other Smart Watches & Activity Trackers. The alaScore™ for this product is 95/100 = Excellent. Last update: 24-04-2019. Accurate. Long battery life. Automatic activity tracking. Measures blood oxygen levels, sleep, stress, and body recovery. Slim, sleek design. Touch screen could be more responsive. Uses proprietary charger. Tracking sleep, stress and energy levels is endlessly interesting with the sleek, stylish Vivosmart 4, but an unresponsive display and inaccurate run tracking proved frustrating. Bought this to replace an alternativevmake. Did a lot of research and read reviews and am so glad I did. Excellent quality, the band is softer and more comfortable, easy to read in sunlight and such a coddle to set up. Looks even better then in photos, very pettite and the strap is so soft and comfortable to wear, really pleased accurate readings and step tracking. 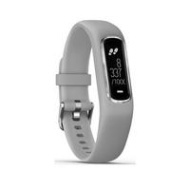 I bought this watch a month ago, it has some really good features rest sleep and fitness I absolutely love this watch it's so easy to use, very easy to pair up to your phone.